Cigarette smoking continues to be the leading cause of preventable morbidity and mortality in the United States, reports the U.S. Department of Health and Human Services. CDC data indicates that cigarette-smoking related healthcare expenditures in 2008 in the United States totaled nearly $96 million, and that the employer bears a cost of $3,391 per smoking employee per year, including $1,760 in lost productivity and $1,623 in excess medical expenditures. 2011 Benchmarks in Tobacco Cessation and Prevention takes a comprehensive look at efforts by the healthcare industry to short-circuit smoking and related behaviors, based on recent market research by the Healthcare Intelligence Network. 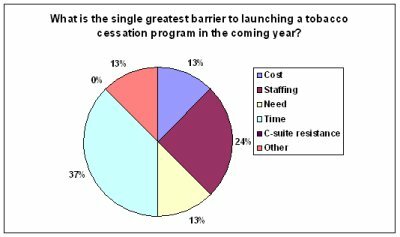 HIN's market research found that smoking cessation is one of the top five disease management efforts for which financial and benefit-based incentives are offered.